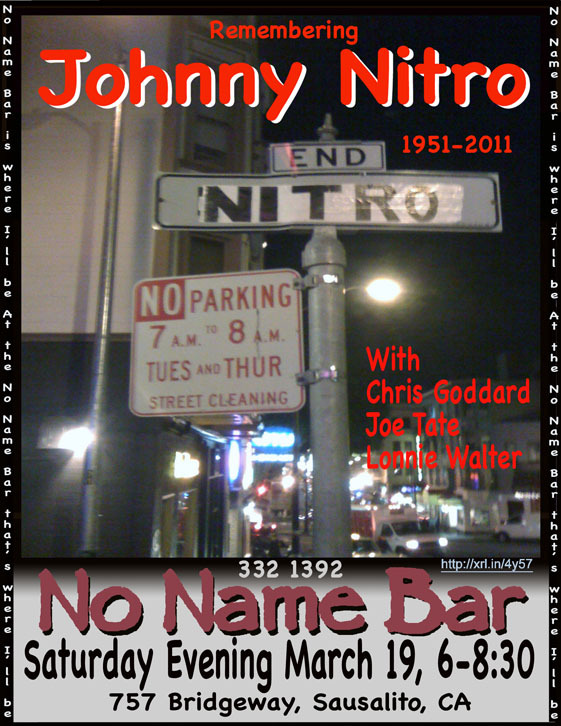 Chris Goddard was substituting for Johnny Nitro, who was to have played the No Name Bar this 19th of March, 2011. Unfortunately, Johnny died just four weeks ago, shortly after booking to play here. Everyone was excited that he was coming. Myron Mu, who owns the Saloon, where Nitro has played for many years, was here that night and he told us the news. Lonnie said “We’re gonna have to cancel Johnny’s date.” It was with sadness that we marked his passing but we tried to rock out for him just as we thought he would have wished. Joe Tate started off with Little Richards Slipping And Sliding then segued into a few New Orleans style tunes that were beautifully backed by Chris Goddard’s well versed guitar. It’s a groovy sound, based not on having full band, but more like a coffee house thing with the bongos and guitars. It’s good listening mixed with some get up and dance numbers. Chris Goddard also sang a few songs. Even though he’s not dancing around, he has still got it going on. 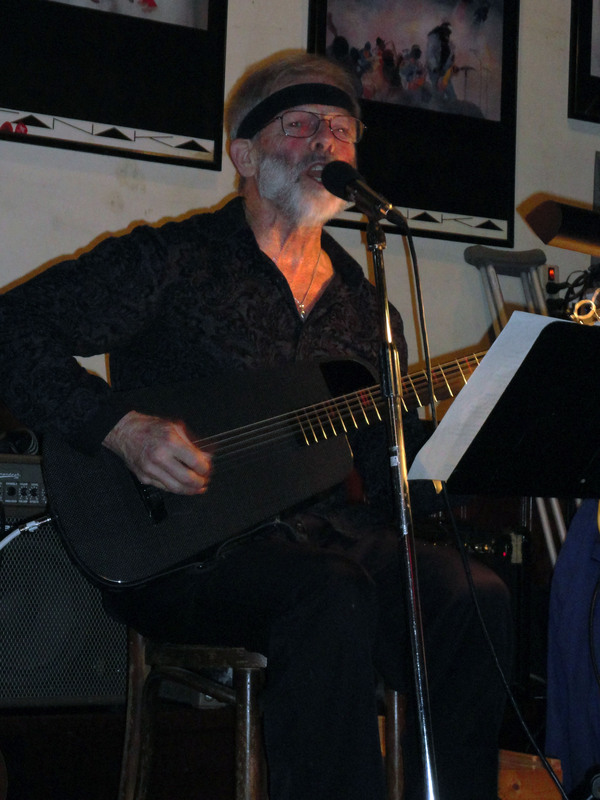 Tom Barr showed up with his harmonicas and hammered out some nice solos on many of the blues renditions. Tom regularly plays with the UFOs in San Rafael at a secret location known as Area 51. Joe joins in the fun there too, playing stuff you never get to hear at the No Name Bar. Tom and Lonnie did some nice backup vocals on some of Joe’s songs and at times sounded like an old fashioned gospel quartet. At intermission Lonnie talked about Johnny Nitro and in between the sentences you could here the rain coming down hard. Lonnie let us all know how much it hurt him. 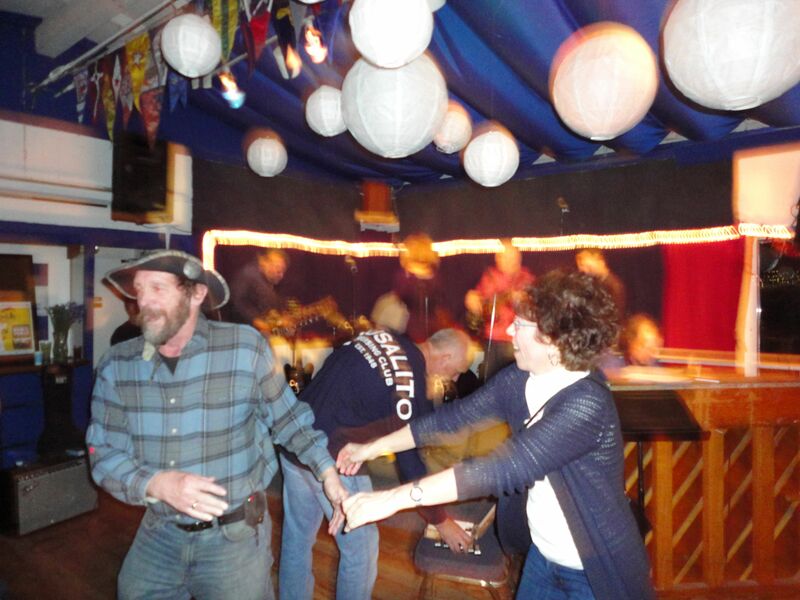 They knew each other well and both had been living above the Saloon on Grant Ave.
Jane Koestel, who was also a friend of Johnny, was there, but declined to speak. Well whaddya know? 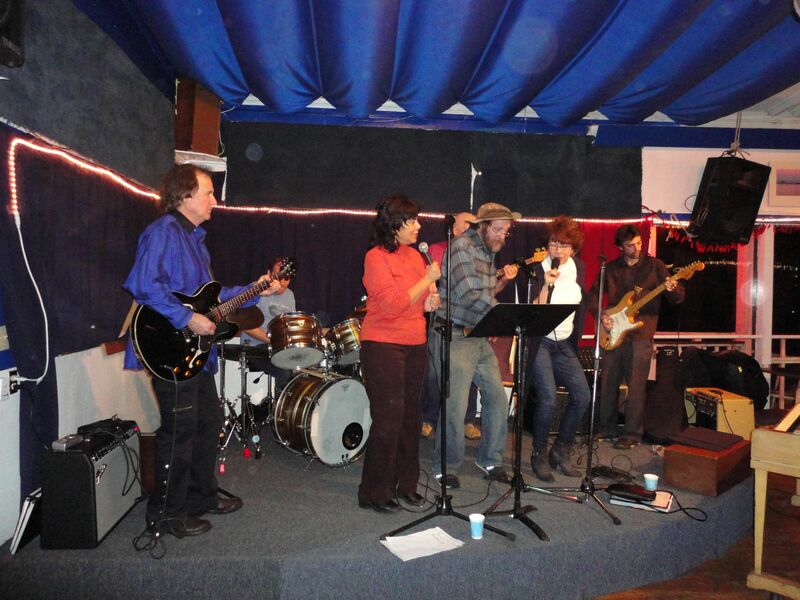 Monday night was frittered away playin the blues and more. The house band, with Joe Tate, Willie Rizer and Donny Kountz did the opening set with “Blue Monday” and some other simple stuff to get the evening started. We had a couple of surprise visits. First was Mike Adams who, as a young teenager, played drums occasionally with the Redlegs. Everyone was amazed at how good could he play when just a boy. Tonight, he took over the drums after Andy Mendell, who was the first jamer of the evening. Andy came up before the end of the set so Donny got some quick downtime. Suzie Olsen also assisted on vocals during the set. As soon as Tate took a break, John “Coyote” Egan took up the guitar like a menacing weapon. The Flying V is just a little scary. At his request, Tate hung on to his old bat guitar and assisted with Coyote’s set. 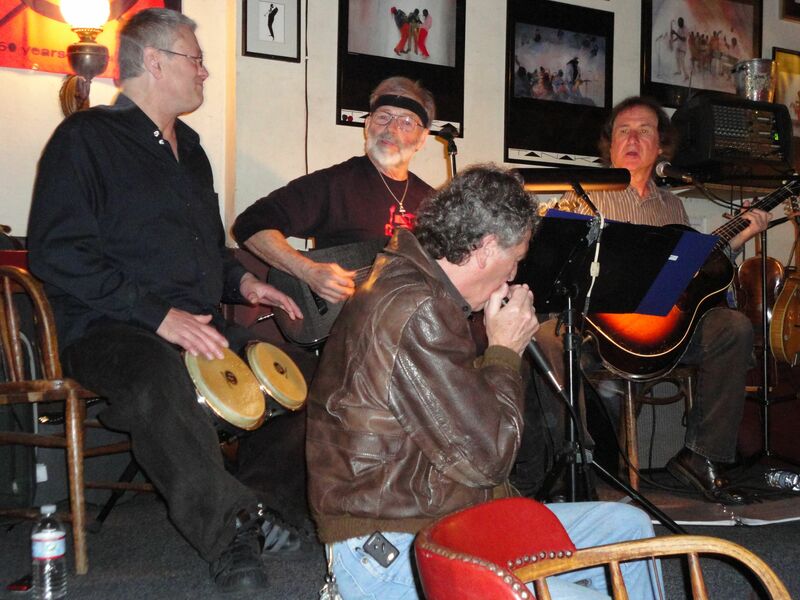 There were generous portions of wailing harmonica with Tom Barr, Scott Sherman and Diver Dave taking turns. Paul Seaward got in on the action too. The second surprise was that four members of the Tickets showed up. 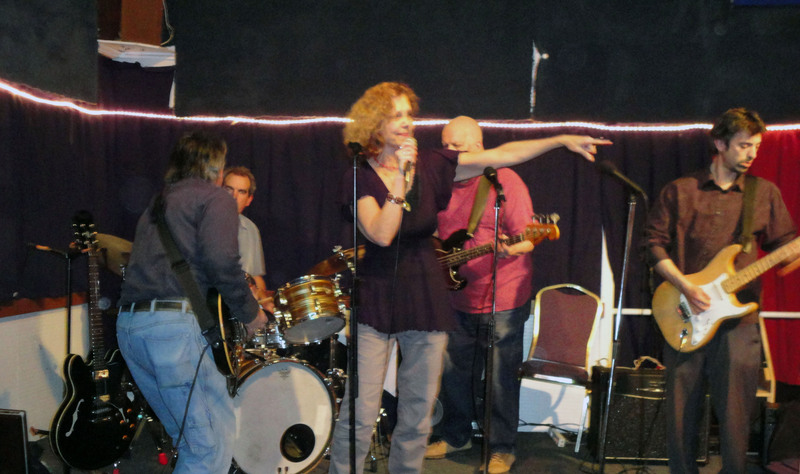 Lead singer Debra Clawson dragged her crew down to the club after Monday Night rehearsal. Apparently they hadn’t had enough howling at the moon yet. They had some new songs they had been working and we got to hear some of the stuff. Some of it was high energy rock with a kind of swing beat. Their drummer, Peter Herbert, has a certain touch that sets these rhythms off. Some Tickets: Will Leidenthal,Peter Herbert, Debra Clawson and Oz. Debra Clawson and guitarist Will Leidenthal do some really nice duets and of course she can belt of the blues like nobodies business. 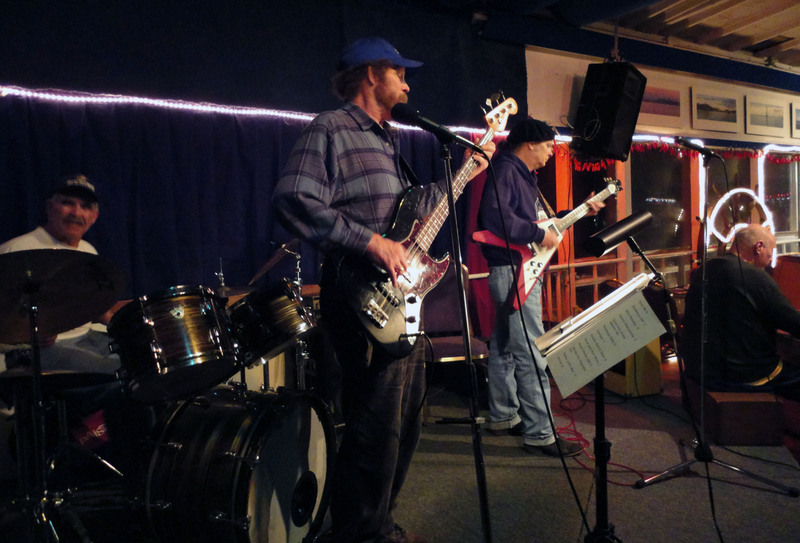 They were joined by their regular bassist, Jeff Suits and drop in guitarist, John “Oz” Gordon. Near the end we were treated to some excellent funk led by pianist, Jerome Phillips. It is always a pleasure to hear Jerome play. He has been playing at Seahorse on Monday nights and showing up here near the end. 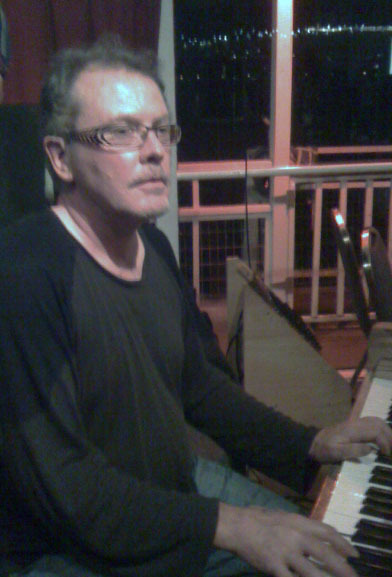 He also plays with Joe Tate at the No Name Bar and will be there with him on the 2nd and 30th of april. 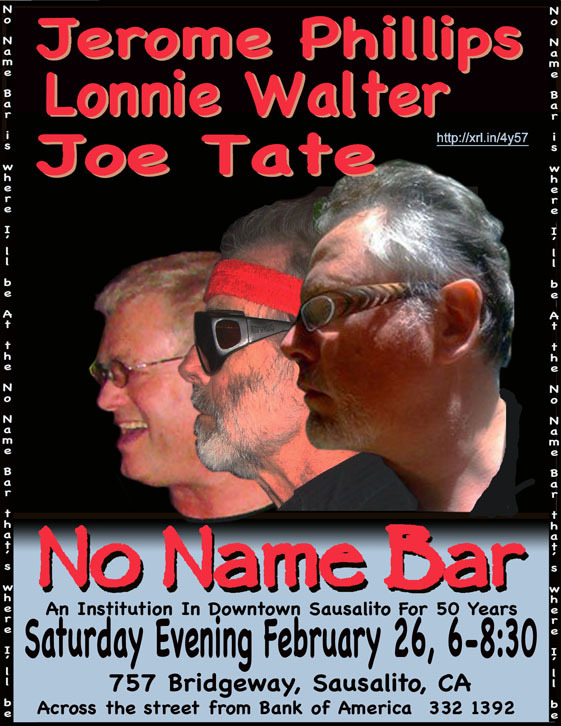 Joe Tate plays the No Name every Saturday with various other artists. You can check out his show there in the early evening, starting at 6 PM. Your regular host, Joe Tate, took the night off due the laryngitis. Jesse Kincaid ably took over for the evening with happening results. There were over 15 musicians who signed up to play and everyone got a turn on stage. 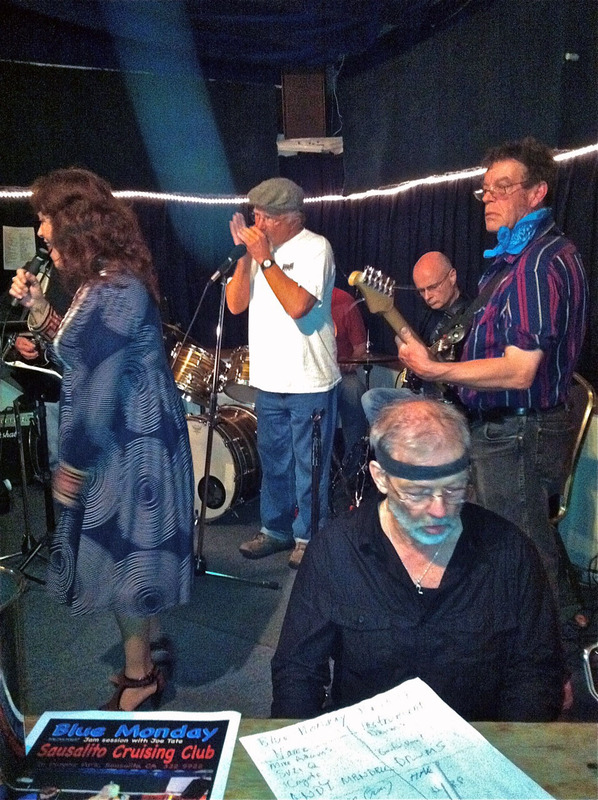 There were guitarists, pianists, drummers, bassists, vocalists and a couple of good harmonicas. Larry Seeger was also there with his “bones” which, surprisingly, can be heard above all the electric guitars and stuff. 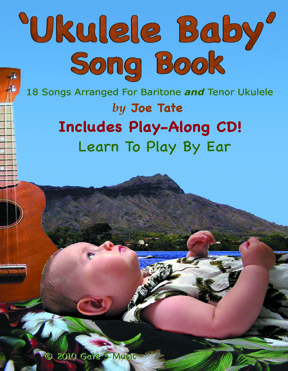 He holds two bones in each hand and, with a deft wrist motion, a staccato rhythm is produced. The house band, consisting of Jesse Kincaid, Donny Kountz and Willie Riser, was joined by Gary Berger and Jim Presta on piano, Gabe Navarre, Ken Markowitz, Craig Caffal, Paul Bowan and Swanee on guitar, Ron Rosano and Ian Lee on drums, Linda Seabright, Gloria Lopez, Sana Hoffer, David Kemp, Suzie Olsen, Donna Dacuti and Sheila McEnary on vocals, Diver Dave and Scott Sherman on harmonicas all sometimes accompanied by David Kemp on bass. Jesse performed a very nice set including some R&B standards like “Midnight Hour” as well as some good blues from Jimmy Reed to Chuck Berry. Gabe Navarre was first to join the jam and gave us some renditions of Stevie Ray Vaughn and Jimmy Hendrix. Gary Berger and Jim Presta took turns on the piano while Scott Sherman and Diver Dave did harmonic harmonicas. That’s two harmonicas at once for a powerful blues motif. 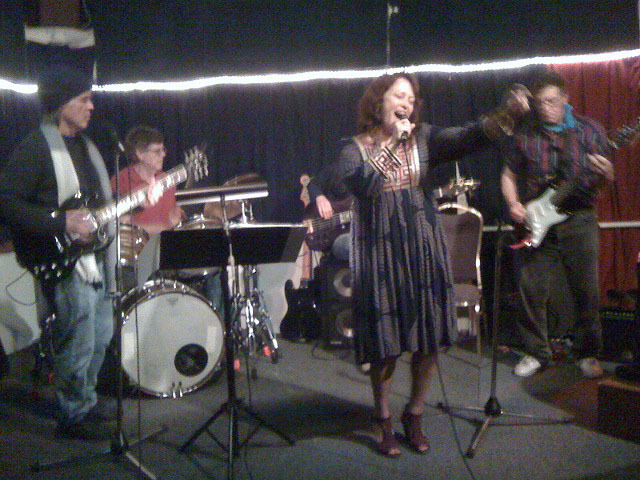 Suzie Olsen gave us a number of old rockers and also assisted on vocals for Jesse and Gabe. 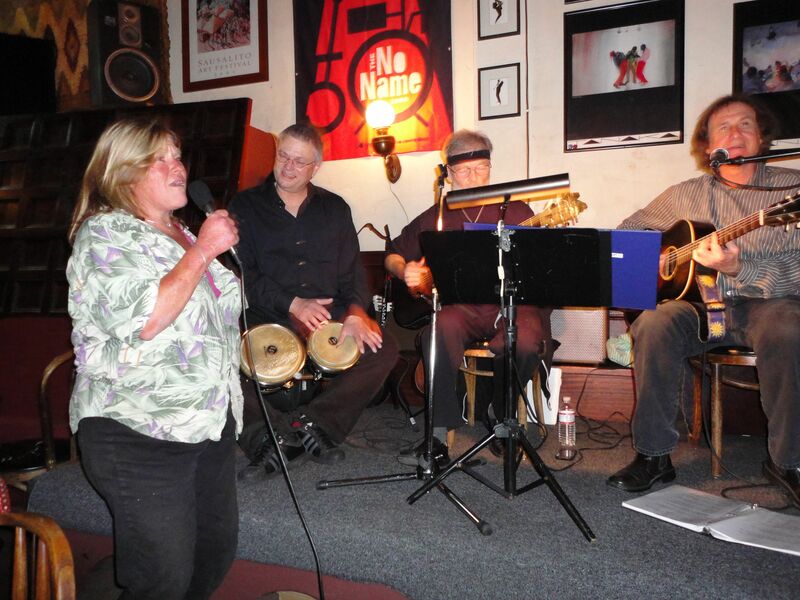 Ron Rosano took over drums for a while and there were some great vocals from Donna Dacuti. We also heard from Sheila McEnary and Linda Seabright. Linda dedicated her performance to her friend Herman, a drummer for Dr. John who had just died. There were also excellent performances by guitarists Paul Bowan and Craig Caffal. These guys are great singers too so they were give a little extra time to unload. The highlight of the evening was the singing trio “Daylight Again” with David Kemp, Sana Hoffer and Gloria Lopez. They sang three songs in perfect harmony starting with Eric Clapton’s “Lay Down Sally” featuring Kemp on lead Vocal. This was followed by the fifties rocker “Don’t Say Nothin’ Bad About My Baby” and finally a soulful “Long Time Coming” in which Miss Lopez stretched out her voice. The last performer of the evening was Swanee who gave us some swamp blues overlaid with grunge guitar with some extra nice backing from Jesse, Ken, Gabe and Ian. 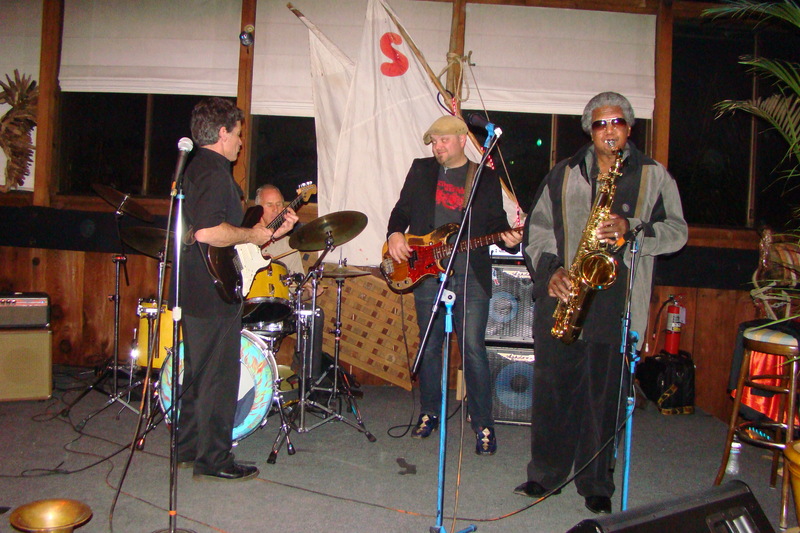 The Sausalito Cruising Club is such a great venue for this stuff and the best deal in Marin for Musicians. If you play at the Blue Monday Jam you can have buffet dinner for a mere 5 bucks. It has a great deck area overlooking the bay where the smokers can usually be found. SCC also has a full bar with a wisecracking Quito mixing the drinks. The next Blue Monday is scheduled for March 14. Please call Joe Tate at 415 385 1606 if you would like to play or attend. If you play guitar or bass all you need is your instrument. You can bring your amp if you like though. It had been a nice Saturday in Sausalito and by 6:00 PM it was starting to mist. Joe Tate, Lonnie Walter and special guest Jesse Kincaid started on time as usual but Joe wasn’t singing. His voice had gone out Friday for no apparent reason. 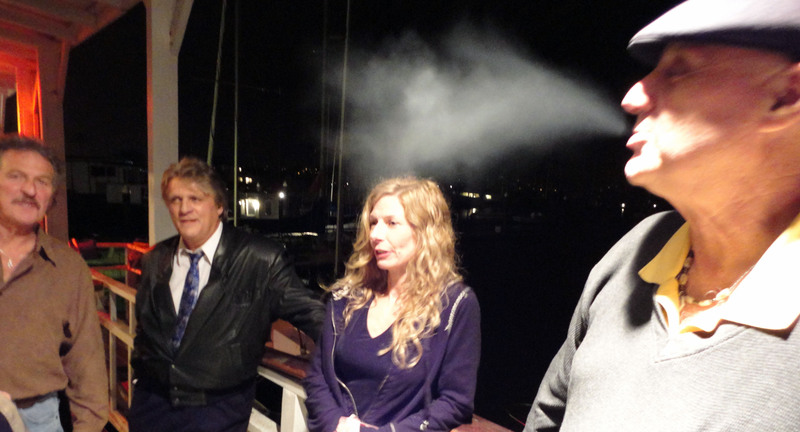 The doctor had given him some Codeine cough medicine but this didn’t do any good. He was able to make the evenings introductions in a broken Jimmy Durante voice but, singing was out of the question. Jesse knew all this before arriving and he dutifully took over the vocals for most of the evening. 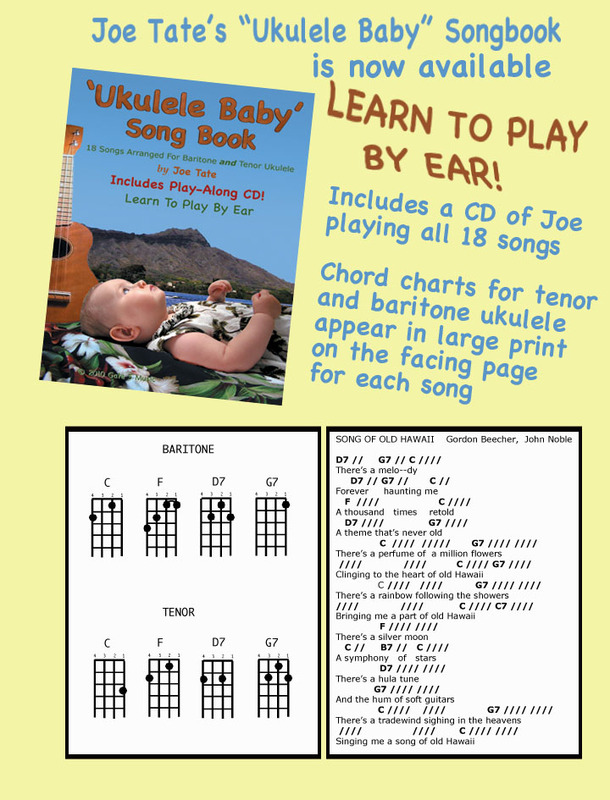 Fortunately, he brought his books and Joe was able to follow all of Jesse’s songs with only minor failures. Lonnie Walter helped out plenty with numerous bongo solos. His ability t0 do this is astounding, with dozens of intricate patterns flowing effortlessly from his hands. The usual crowd was there along with a few tourists. The bar wasn’t as full as usual and this could have been because of the weather. It could also because Joe Tate wasn’t screaming at the folks outside on the sidewalk to come in. This has been known to work in the past. Suzie Olsen lends her voice. Paul Seaward also helped out on a number of songs with some harmonicas he just happened to have with him. Jesse Kincaid does a lot of Beatles, Elvis and regular old Jimmy Reed. Joe skipped around between guitar and ukulele though he didn’t do any of the Hawaiian stuff, probably something to do with the voice issue. His guitar is unusual and has a distinctive sound. It’s one of those new fangled carbon fiber things with a small hollow body and a real old fashioned delta blues tone. Near the end of the evening, Chad Brown showed up sang a couple country songs. 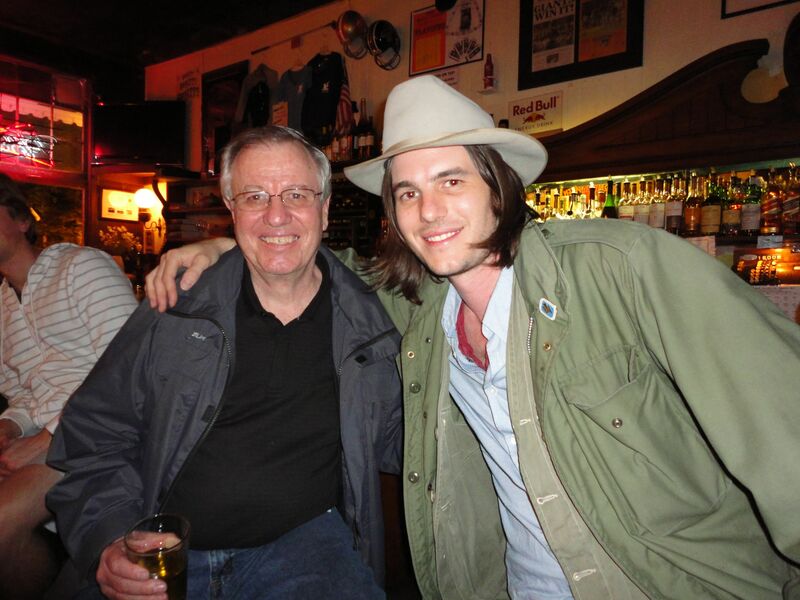 He was there with his dad and Frank Simpson who is married to Maggie Catfish, a regular performer with Joe Tate at the No Name bar and also Chad’s mother in-law. Twas a very nice closing after Chad finished. With everyone milling around and chatting, the next performers arrived, namely Wendy DeWitt and her band. Wendy forgot to bring a mic stand so she borrowed one from Jesse. At least he didn’t have as much stuff to bring home. 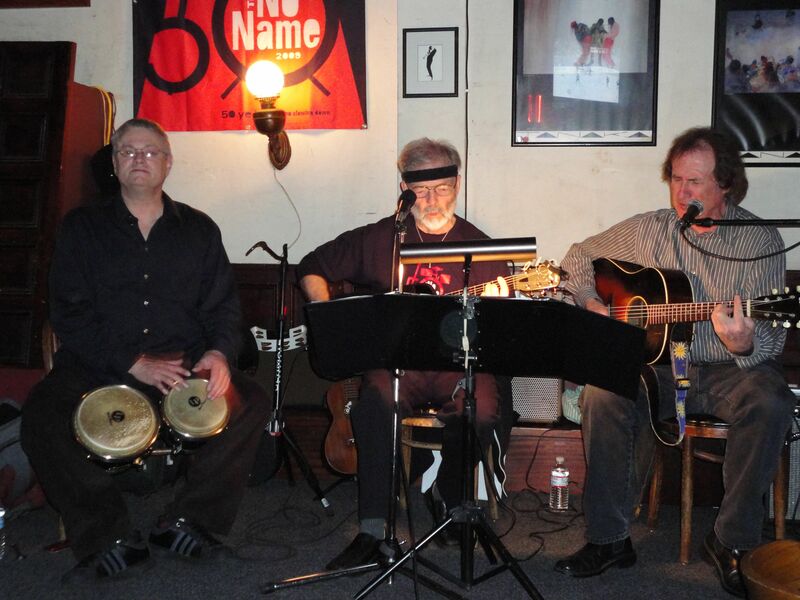 This Saturday we welcomed Jerome Phillips to the No Name bar for the first time. Jerome is a first class pianist who can play bass with his left hand while doing all the other stuff like melody and vocals. With Joe Tate on guitar, the sounds of New Orleans rang out like the French Quarter for the first set. Lot’s of blues and rock followed and Jerome sang some nice country stuff. It was one of the coldest nights this year and the Irish Coffees were moving. Joe’s usual friends were there along with some new people who showed up to see Jerome. Also in attendance were numerous unsuspecting passers-by who stopped in for the warmth and grog. Unfortunately, Lonnie Walter of the bongos, didn’t show. He has been pretty down since Johnny Nitro died and we can only hope that he can get over the hump soon. We missed his wonderful rhythms though. But we made do with what we had. Fortunately, our audience didn’t care and we sailed through it all with jovial ease. 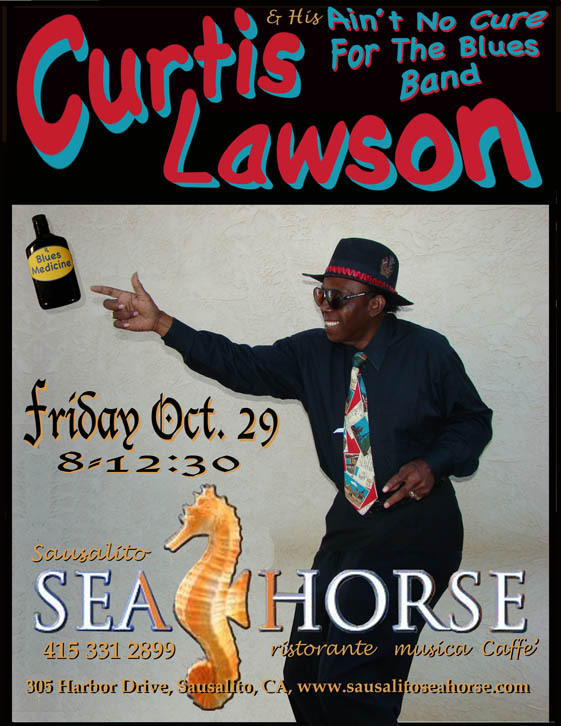 Curtis Lawson celebrates 55 years of singing the blues in the Bay Area on this occasion. It’s also his 77th birthday and the man is still going strong. 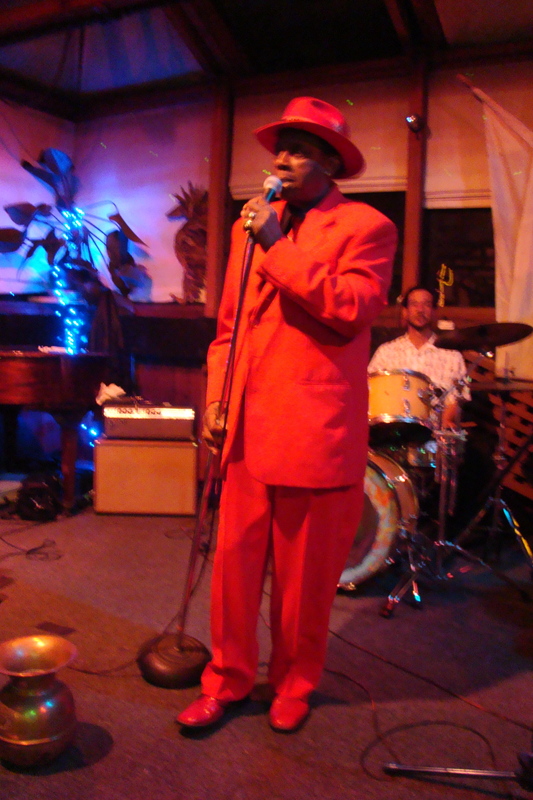 Curtis, dressed in his snazzy red suit, takes the stage and pumps out “Turnin Point,” a song made famous by Tyrone Davis back in the 70’s. This is followed by the hearfelt “My Woman,” Curtis’ own poignant song about his wife, Linda. After covering a few Jimmy Reed numbers, he moves on to James Brown, Wilson Picket and Otis Redding. It was raining so hard that the noise on the roof could be heard over the music. Curtis thanked everyone for coming out in such rotten weather, of course. He invites Jay Johnston of KPOO Radio to the stage who recounts the history of Curtis Lawson and reminds us to tune in to 89.5 FM to hear his regular broadcast, Blue House Party every Monday. 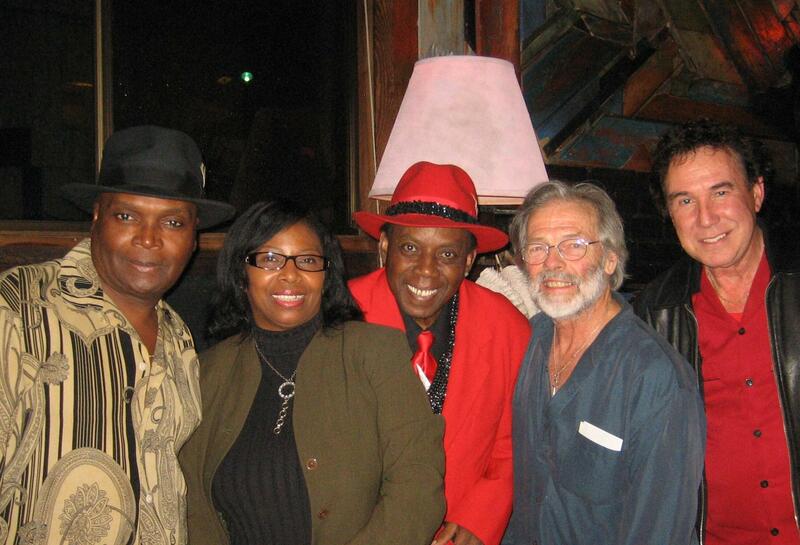 Bobby Webb also has a blues show on KPOO every Tuesday at 9:00. Before taking the stage Jay showed us some of his really cool moves on the dance floor. Just sitting there at his table, you have no idea how agile he is. Anyway, when Curtis comes back, he starts inviting his friends to the stage starting with Joe Tate who belts out a couple of rockers, “High Heeled Sneakers” and “Down Home Girl.” Gail Muldrow followed with some high powered vocals and superb guitar shredding. 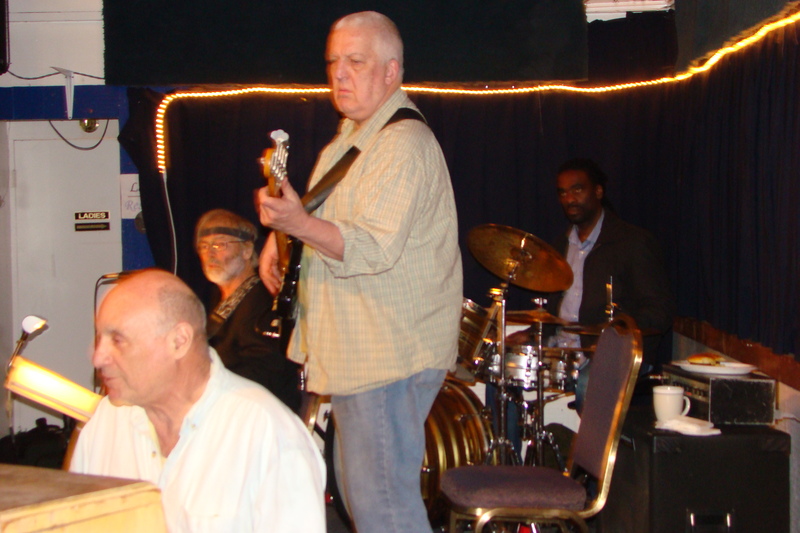 After some various artists sat in on drums and bass, Curtis came back and sang James Brown’s “Please please please” with Tate and Muldrow backing the vocals. Before they could step down it was “The Night Time Is The Right Time,” the Ray Charles classic. Curtis Lawson has to be one of our greatest local artists. He can be heard at the Saloon in San Francisco, the Sausalito Art Festival, the Marin City Festival and occasionally at the No Name Bar in Sausalito. All in all, it was a great show. If you get a chance to see Curtis, don’t miss out. 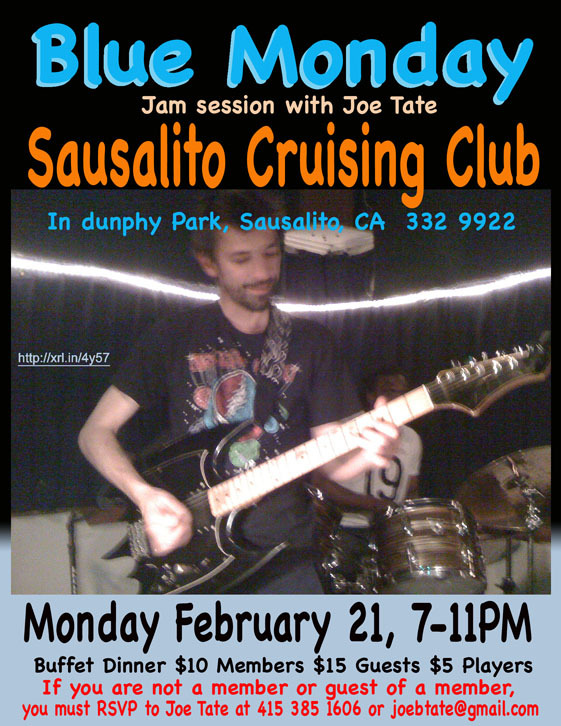 Another great night of fun was had at the Sausalito Cruising Club Blue Monday jam session on Presidents day. 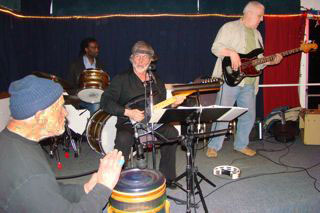 The house band consisted of Joe Tate on guitar, Willie Riser on bass and Donny Kountz on drums. Don Bradley also assisted using a hand drum mad from some weird plastic container. There was also some wonderful harmonica from waterfront local Diver Dave who assisted throughout the evening. Also assisting was Jim Presta on the upright piano which was dragged over to the stage and had a microphone jammed between the sound board and the frame. This actually works pretty well and the piano can be heard along with the electric instruments. Jim lays down a mellow kind of New Orleans groove that works well with the mixed bag that Joe Tate plays. Joe Tate played a nice set of songs culminating in “Tell Me Why You Like Roosevelt,” which recounted the life and death of our greatest president. This old song was written by Mckinley Peebles to mourn the death of FDR. The song also outlines the importance of Abraham Lincoln in freeing the slaves. Tate says we’ll be hearing more of this rockin number. The jam session started with Ken Markowitz singing some standard blues with Cole Tate adding some scorching solos. Cole then did a couple of original songs that were captivating in their simplicity. Next, Jim Swanee sang something like “Peace and love” with Cole, Donny and Willie doing the backing. Drummer, Ron Roscano took over the drums and Suzie Olsen sang “Love Potion Number Nine.” At this point, Scott Sherman joined in on harmonica. Diver Dave let him use his mic and amp. 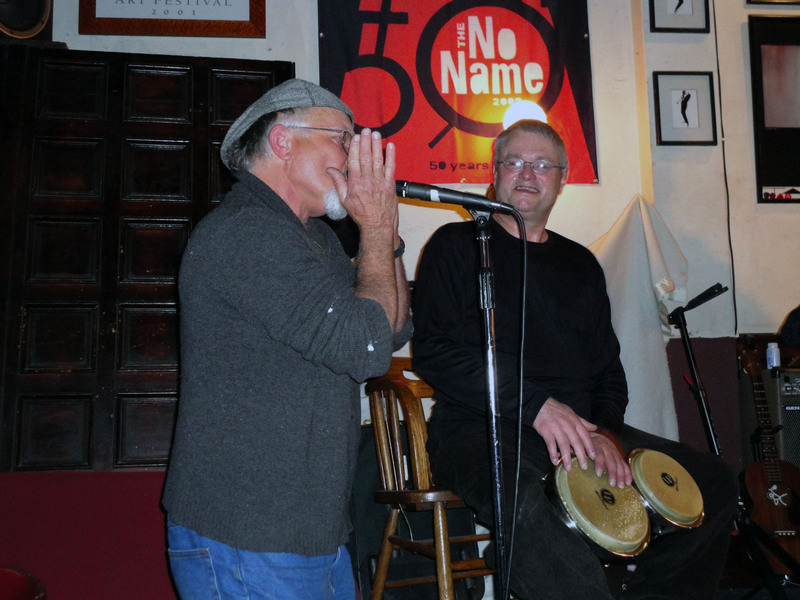 Joe Tate handed Diver Dave another mic and we were treated to dual harmonica solos. This sounds like a harmonica that never runs out of breath as it weaves in and out from one melody to another. 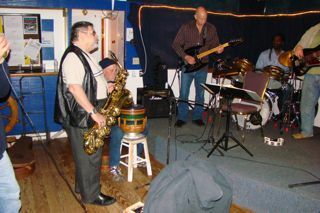 Ray DiFazio brought his baritone sax which added a whole extra dimension to the sounds. 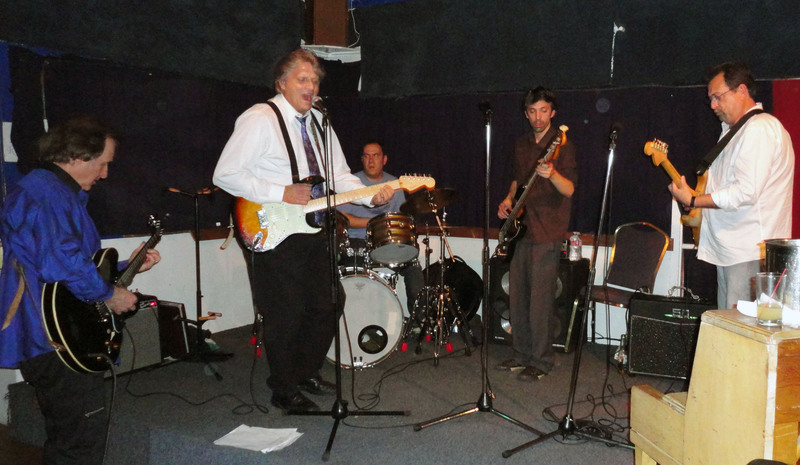 Ray has a group “Scary Larry And The Monsters” and they are playing at the Seahorse Restaurant on Friday March 4 at 8:30. Donna Dacuti treated us to some fine blues vocals and threatened to sing “Georgia” but no none knew the changes in her key. She will bring the chart next time. Lastly we had John “Oz” Gordon on guitar then Joe Tate closed out the evening with everyone singing “The Last Time” an old spiritual that was remade by the Rolling Stones.